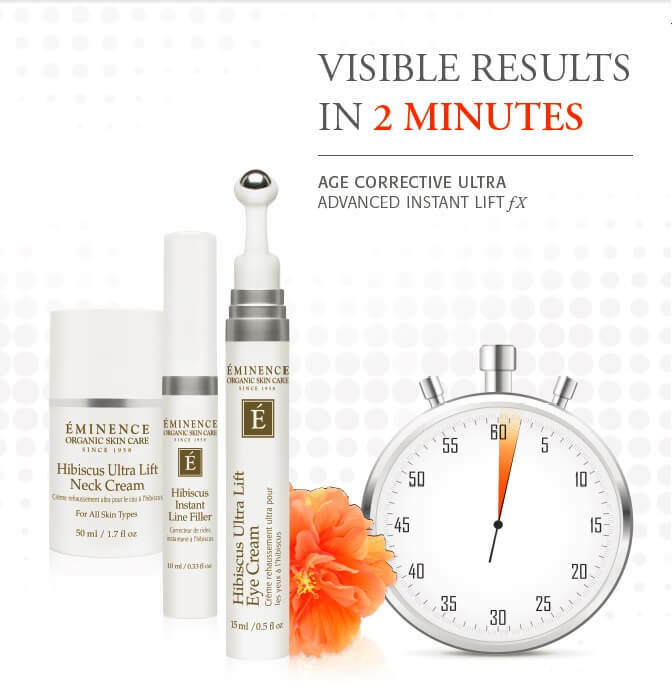 Éminence Organics introduces Age Corrective Ultra, formulated to instantly lift, firm and tighten, as the premium addition to the best selling Age Corrective collection. These three new products dramatically improve the appearance of puffy, tired eyes, sagging skin and even the deepest expression lines. Featuring firming and lifting hibiscus, botanical peptides, and a unique ice wine active, these products deliver results in minutes, and show long-lasting improvements over time. With results in two minutes or less, just one application will reveal a red-carpet-worthy new you. Designed to visibly smooth wrinkles and reduce under-eye bags, the natural peptides and caffeine combine forces to de-puff and minimize dark under eye circles. Layer your favorite Éminence hydrating eye cream over top to transform tired-looking eyes in a flash. As a natural alternative to lipofilling, the active ingredient Voluform™ works on multiple layers of the skin to instantly fill lines from the inside out while stevia extract minimizes the stress-induced muscle reactions that cause wrinkles to form. Expect both immediate and long-lasting more youthful looking results. It’s one of the most tell-tale areas to show signs of aging, yet one of the most difficult to treat. The all natural active ingredients in this potent neck cream give sagging skin a stimulating boost from paprika, and the tightening properties of edelweiss ensure the neck is smoother and instantly lifted.